A Grinder is a vital tool for thorough vaporization of dry herb. This mid-sized 4 Piece Grinder breaks dry herb down so there’s more surface area with which heat can make contact. By evenly grinding your dry herb, this 55mm Dia. Grinder helps you get the most out of each bowl. The durable zing body along with the teeth are sturdy and sharp. The 4 Piece Grinder features a bottom compartment with a pollen screen for collecting your most precious “material”. Included with the grinder is a scrape tool for cleaning and scooping up collected kief or dust. Large enough to easily grind a generous amount of dry herb, compact enough to stay discreet and easy to carry, the grinder is the perfect companion for dry herb enthusiasts. At just 55mm Dia., this herb grinder is pocket friendly, while still boasting a sizable grinding chamber. 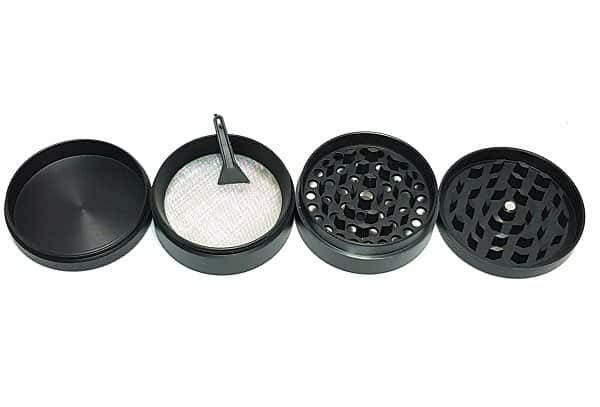 Those with busy lifestyles will appreciate the portability, stealthiness, and quality of this sleek, solid herb grinder. Built tough with a high grade zinc body and teeth, the 55mm zing Grinder efficiently grinds herb down to finer granules, catching kief in the bottom compartment so you can make use of every bit of your dry herb. If dropped, the 4 Piece Grinder won’t break. And the precision engineering ensures all the pieces fit together snugly and twist smoothly when in use. This high quality herb grinder shines through in delivering finely ground dry herb in a fast and easy manner. Very cool looking unit. Rubber coating make the unit feel good in you hand. Easy draw. Very well made. Does a perfect job. Works very smoothly, now my new daily grinder. Fantastic for grinding herbs. Josh is super helpful. I love this grinder, it works great and is very durable. Best grinder I’ve ever had. Excellent grinder, recommend it to anyone. Great spare .Feels heavy. Its a grinder….. I got this free with the Crafty and it works quite well. Nice Grinder for free can’t complain. Josh is unusually knowledgeable in all areas of the merchandise at Tools420. Honesty is an increasingly precious and rare thing to encounter in retail today, and with Josh, all you get is pure honesty, backed by his impressive research into any topic you might breach during your visit. I wish there were more like him. This grinder is ok. It needs to be cleaned frequently as it gets too sticky to grind, product gets stuck in the top part, especially new pot that still has a lot of resin and it doesn’t produce a very fine grind which I sometimes want. But it was free so I can’t complain about it too much. I now own two because it seems to be a popular give-away. Best grinder ever – for free! It’s ok. I think. I don’t have much to compare it to but it seems to grind pretty coarsely. Could do with slightly finer grinds. Nifty little grinder. What else is there to say. But… Will it grind? Well yes… It is a grinder. Free gift, you say? Don’t mind if I do! Does what’s needed and is well-made. Great metal grinder as a free gift for my other purchase. Does it’s job well and is very easy to use. Zeus arc is still being tested so it’s hard to say if it’s gonna last. Build seems pretty stout. Cloud production is ok and for what I need, it fits the bill perfectly! The Grinder is also nice, but heavy.. With sticky, it takes a bit more cutting and it’s harder to fall through the small holes, but that’s pretty normal.. All in all, good experience so far.. I think this is a system glitch. This wasn’t part of my order and didn’t come in the package. I’m not sure why I am being asked to review it.